The Washoe County Sheriff’s Office is investigating a routine wildlife report that turned fatal for the animal on Saturday, May 6, in Incline Village when a deputy shot and ultimately killed a black bear. According to an incident report from the sheriff’s office, the deputy was responding to a call about a group of bears close to some homes near Driver Way and Village Boulevard, when she accidentally shot the bear with a live round instead of a rubber bullet. The bear, known to locals as Jasper, and her three cubs, had been identified as food aggressive several weeks earlier after other encounters with deputies. “It appears, on the report that I read, that the bear was walking toward the deputy and the bullet struck the bear in either the left or right shoulder area,” said Washoe County Sheriff Chris Allen in an interview with the Bonanza. The sheriff’s office is currently conducting an internal investigation into the incident, Allen said. In areas where bears are common, law enforcement officers will sometimes carry two different firearms, one black for live rounds and one orange for rubber bullets. Allen said that although the Washoe County Sheriff’s Office has both of those firearms, and he believed that the Incline Village officers carry them as well, the particular deputy that arrived on scene had been assigned to work in another area that day and was not carrying both weapons. “This particular deputy was working in south end of Washoe County, down in the valley, in the Reno area,” Allen said. He said that he wasn’t sure if the deputy who shot the bear had undergone any training in managing black bears, and that it was one of the questions that investigators are examining. 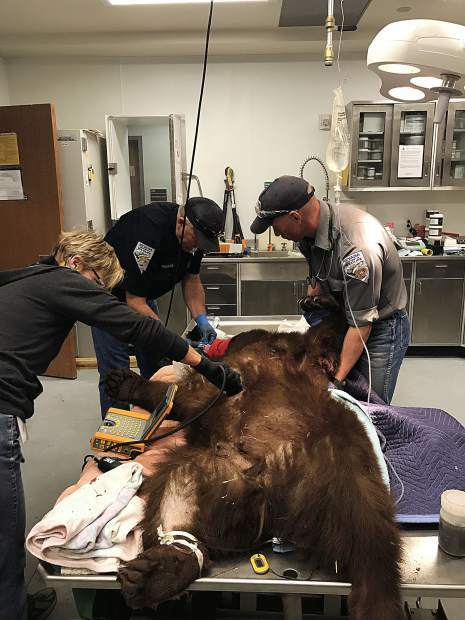 After the bear was shot, Nevada Department of Wildlife officials arrived on the scene and transported the bear to their veterinary facility in Sparks, Nev. The cubs, which are nearly old enough to leave their mother, were left behind. 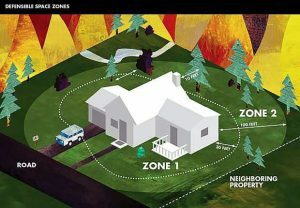 He said that NDOW, which has its main offices in Reno, does not have any officers patrolling in Incline Village, and they were not alerted to the incident until after the bear had been shot. Typically, in Incline Village, sheriff’s deputies are the first to respond to bear-related incidents. Healy said that NDOW has partnered with the sheriff’s office in the past to provide training to deputies on dealing with black bears and understanding their behavior, but he wasn’t sure how recently that training had occurred. Healy said that since the mid-90s, bears have become very attuned to humans being a source of a food in Lake Tahoe. Once they discover that they can get food from a person or in a certain location, they’re likely to return. “We do our best to keep bears alive and wild, but we also have an obligation to worry about public safety, so we’re constantly juggling with the desire to keep everyone safe and bears alive and wild,” he said. But Healy also said that just because a bear is seen often does not make it a dangerous bear. Despite the image on the California state flag, the only species of bear in California and Nevada is the black bear, which is know for being far less aggressive than the grizzly bear and much smaller in size. The bulk of the issues with black bears around Lake Tahoe are food-related. When bears learn they can get food from human sources, such as improperly stored garbage, they can create conflicts with people. 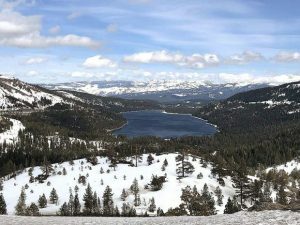 “You can call Incline Village a town and say that bears don’t belong there, but that town is right in the middle of Tahoe National Forest and they have every right to be there,” said BEAR League Executive Director Ann Bryant. The BEAR League is a local nonprofit that promotes education on living with black bears, and assists residents and government agencies in managing the animals. Bryant and a team of volunteers are currently searching for the three missing cubs in Incline Village, who were left behind on Saturday. She said that while two of the three cubs were nearly old enough for the mother to “disperse” with, cubs generally wait for that cue from the mother. In this case, they won’t receive that queue. Bryant said this is generally a busy time for the league, since many juvenile bear cubs are dispersing from their mothers and learning how to make it on their own. “You have to be tough and teach them how to make it on their own, and that’s not by feeding them,” she said. Bryant said that in her experience, cubs that have dispersed begin to learn by late summer how to survive on their own. Correction: An earlier version of this article incorrectly used the word “queue” where it should have been “cue.” The error has since been corrected.